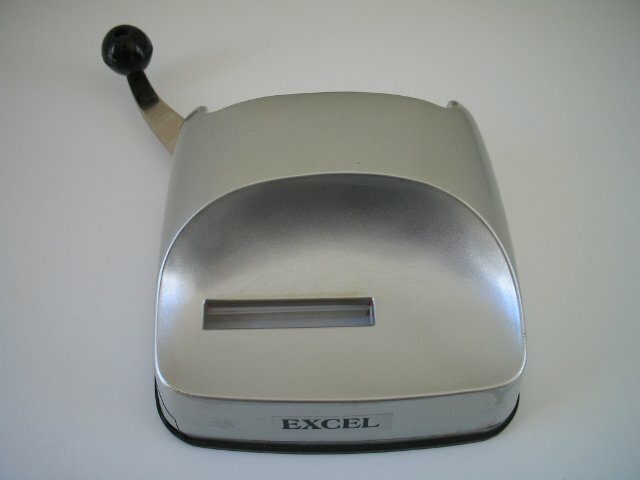 The Excel is RBA's lowest cost machine. I started with the Excel because of the good reviews and because it was low risk (i.e. pretty cheap). The starter kit I bought included the Excel and was cheaper than it would cost to buy the 2 cartons of cigarettes that the kit could make, i.e. all I needed to do was to make 2 cartons and I'd break even, nothing lost if I decided stuffing my own was a PITA and not worth the effort. Its a good machine that is in some respects better than the Supermatics. Its easy to hold on to, its got a bowl shape to hold/contain the tobacco and its got a nice smooth consistent action. The plastic parts allow for better fitting, naturally lubricating, parts. You don't get the scratched metal and tobacco residue buildup of the Supermatics. I grab a hunk of tobacco (enough for ~3 smokes), drop it into the Excel bowl and tamp the tobacco into the slot. The bulk of the tobacco sits on the back slope of the bowl and I slide/pack it into the slot. You don't want the tobacco piled up on top of the slot or you'll get an uneven and loosely packed smoke. The one issue I have with this machine is that over time it doesn't grip the tube hard enough, it lets go of the tube before it is fully stuffed, i.e. leaves a void between the filter and tobacco. While other factors like over/under stuffing, brand of tubes (Escorts are more forgiving than Silver Tip's) and/or the tobacco's moisture content (to high or low) can play a role the machine itself can also be to blame. The first thing I tried was using a small strip of 100 grit sandpaper to both roughen and insure the radius of the gripper and nozzle matched. This worked but had to be repeated when the contact areas smoothed back out over time. This hassle prompted me to buy a Premier Supermatic. While waiting I got the idea to drill out the center of the gripper/tube holder and was able to make a silicone rubber insert slightly proud of the surrounding plastic. This was effective but not given a long term test. What I finally realized is that the tube wasn't being released until after the spoon was pushing it off. The friction was polishing off my earlier sandpapering. The solution may have been as simple as replacing the worn (non adjustable) tube release. The Excel tube release (non-adjustable) is a bit on the late side for filterless smokes. 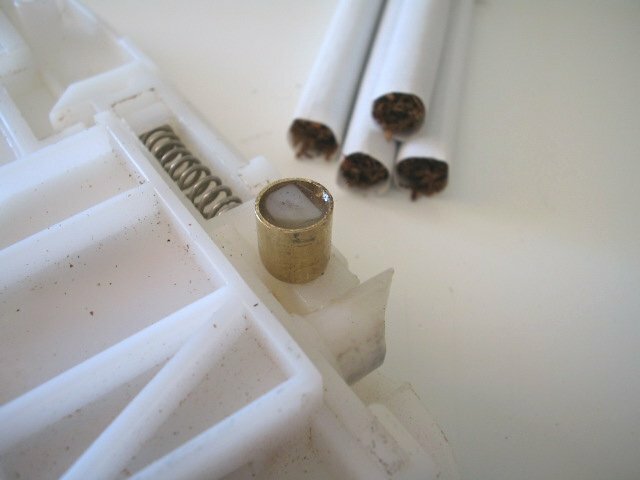 If the release is too late the tobacco plug can be compressed/shortened because there is no filter for the tobacco to bump/push against. With the Excel this typically results in a void at the nozzle end of the smoke. The Excel can be modified for an earlier release using 9/32" brass tubing placed over the release (epoxy fills the gaps). This modification allows a much tighter grip onto the tube. First: take a small piece of sandpaper (or dremel tool) and roughen the curved edge of the Excel gripper. try to remove about 1/32" of material. Second: mix up about a pea-sized amount of JB-Weld and apply a light coating to the roughened surface. Third: Apply a small piece of rubber from a balloon onto the gripper and , using a round ink pen, squeeze the rubber into the JB-Weld to squeeze out an excess glue. Picture shows a stock and modded gripper. sorry that the image isn't very good. also shown is the bottom of the Excel which i cut out so i could remove the bottom without removing the rubber base. You can send your machine to ARBRO Inc or get parts from them and fix it yourself. May 06: Added a couple of images (1 and 2) that may help when reassembling an Excel..
A crank machine that is somewhat similar in appearance to the Excel. Mechanically it is different and apparently not a very reliable... The Smokey Mac appears to be the same machine.